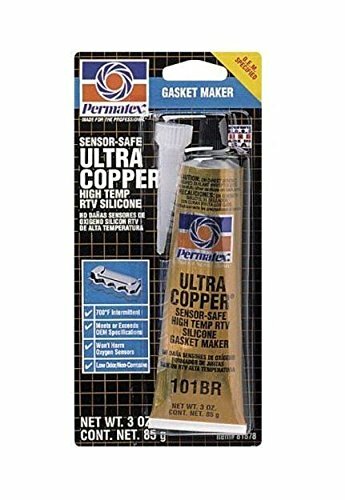 Permatex 3 oz. Ultra Maximum Temperature RTV Silicone Gasket Maker. OEM specified. For high operating temperatures common in 4-cylinder, turbocharged or high-performance engines. The most advanced, high temp RTV silicone gasket available. Three times more oil resistant than conventional silicones. Eight times more flexible than cut gaskets. Sensor-safe, low odor, noncorrosive. Temperature range -65°F to 700°F (-54°C to 371°C). Resists auto and shop fluids and vibration and super adhesion. Suggested Applications: Exhaust manifolds/headers, valve covers, oil pans, timing covers, water pumps, thermostat housings, slip fit exhaust pipes, muffler end caps, intake manifold end seals and exhaust tubes.